The first time your baby develops a bad cough, it can be extremely worrying. However, coughing, wheezing, and developing a cold is actually pretty common during the infant stage, and even while your baby is teething. You usually have absolutely nothing to worry about, though a quick trip to the doctors is always reassuring! Once you know it’s nothing serious, the big question is how can you treat it? When adults have a cough, over the counter medicine usually works wonders. However, for babies and toddlers, you can’t just buy any old cough medicine due to potentially nasty side effects. Here, we’ll look at ways to soothe a baby’s cough without, or as a supplement to, medicine. While these home remedies for your baby’s cough are considered safe, it’s also important to point out here that any medicine you do give to your little one should always be prescribed from a doctor. When your baby’s cough is accompnaied by a cold, one of the most common solutions is saline drops. These are easily found in your local drug store, and they really help to reduce swelling of the airways, as well as thin mucus from the nose. These nasal drops really are great at reducing discomfort safely and quickly. They can also be purchased on Amazon quite cheaply, and are worth having around for when you need them in the future. Alternatively, you can also try and take baby into a steamy room. This has a similar effect when it comes to unclogging the airways. Some parents even suggest using a humidifier with Eucalyptus oil. However, before using any essential oils it’s important to do your research as some are harmful to babies and toddlers. Click here to learn more about essential oils and how they can help your baby’s cough. A humidifier on its own without any added oils will work just as well. Be aware however, that mold and other bacteria can build up in a humidifier over time. So, it will need to be cleaned after each use to ensure it doesn’t make your little one even more ill.
You can also give baby more frequent steamy baths, or turn the shower on and leave it running for a while before switching it off and taking baby in the room, shutting the door and sealing off any gaps to allow the steam to build up. Stay in there for around 15 minutes for the steam to take effect. If your baby is still really young, a bulb syringe is often a fantastic product to use alongside saline drops. They are especially great for use just before a feed. Using the bulb syringe around 15 minutes prior to bottle or breastfeeding will help unclog the nose, making it easier for your little one to feed. You’ll need a saline solution, whether nasal drops or a homemade solution, along with a rubber bulb syringe. It is recommended you use a store-bought solution as making one yourself is a lot more difficult than you might think. If made incorrectly, organisms contained within tap water can cause an infection in baby’s nasal passages. So, store-bought is a much safer alternative. When baby has a cold, they’re going to need more fluids than usual. Excess liquid helps to thin the mucus and ease the symptoms. However, unlike with slightly older children, the fluids you can give to baby are limited. Simply increasing the amount of feeds you give your little one is the best idea. Don’t try to give babies under the age of six months water or juice. When suffering from a cough or a cold yourself, you’ll probably know that keeping the head raised when you’re lying down can help a lot. Place a pillow or a folded-over towel inside your baby’s crib so they can rest their head on it. This raises the head, clearing the airways slightly and making it easier for them to breathe. If baby is older than six months, you’ll want to focus on giving them foods that are easier to swallow. Anything soft and smooth will help to soothe a sore throat associated with the cough. Try yoghurt, pudding and ice cream for example. If baby is younger than six months and is struggling to drink enough breast milk or formula, a visit to the doctor or pediatrician will be required. When trying to treat baby’s cough, it’s important to seek advice from your doctor. If you look online, you’ll discover a wide range of natural remedies are recommended. However, these should be avoided unless your doctor says they’re ok. Even natural-based ingredients may not be safe for baby to take. While many baby coughs can be treated naturally, occasionally they may need proper medications. Again, these should always be prescribed by the doctor or pediatrician. Many cold and cough medicines aren’t safe for children under the age of 2, so it’s best to be safe and check before giving them anything. Another reason you’ll want to seek your doctor’s advice before treating a cough is because coughs can be triggered by different things. If the cough is coming from a problem with the lungs for example, rather than a cold, it could be potentially dangerous. Overall, the above are the best ways to soothe a baby’s cough. However, as mentioned above, it is important to seek professional advice before you attempt to treat the cough yourself. The cause will need to be determined, otherwise you risk it progressing and potentially making it worse. When it comes to baby’s health, you can never be too careful. I still remember a while ago when my little boy caught a cold from the kids in the pre-kindergarten. It was so tough to get rid of. He kept coughing so hard that sometimes I felt like he would choke. It hurt me watching him struggle so much. What seemed to help the most was a bit of honey. I gave him half a spoon of honey before he went to sleep and it seemed to soothe it down for a while. We also did what you suggest – easy to swallow foods. Sadly, we did have to go seek a doctor’s help and he got prescribed a cough syrup. I am really happy that it’s all solved now. Aw, sorry to hear. 🙁 Isn’t it one of the worst feelings when you want so badly to help them, but there’s just not enough you can do – at least not right away? I’m glad to hear he began feeling better quickly but it can sure seem like forever when you’re worried about them! These seem safe but sure methods to treat a baby’s cough. In these suggestions the baby is not subjected to anything uncomfortable and that is what makes them acceptable. You’re right! 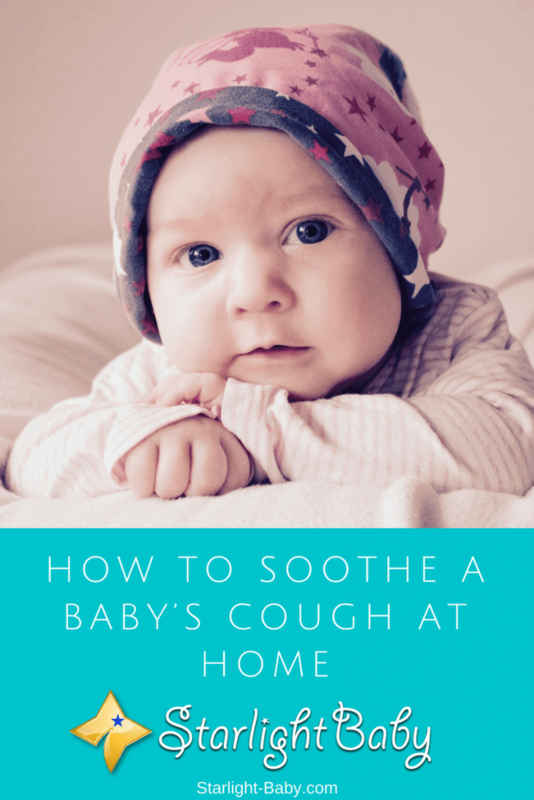 These are safe ways to help relieve a baby suffering from cough. Saline solution, particularly, provides immediate relief most of the time and alleviate frequent coughing. I always keep it in stock. I am reading this article at the right time. Our four months old baby is coughing these days. We have not taken him to the doctor because he might suggest using antibiotic and we don’t want to administer antibiotics to our infant. An experienced parent suggested us to give the baby hot oil massage and this remedy is working. I did not know about the usefulness of saline in a cough. I might try this. Same here, vinaya. As much as I can avoid it, I don’t want to give my kids antibiotics because it has side effects. I prefer natural cures because they’re safer. Giving a baby a hot oil massage is something new to me. I didn’t know of that. I might try that with my kids, too (I hope it works for bigger kids and adults because my husband has a cough right now). This is really interesting piece of information, I have actually seen some parents makes use of saline drops and it works perfectly fine in soothing baby’s cold/cough. I also think that curtailing the exposure of the baby’s body to cool environment is going to be a great help. By making sure that the baby is well clothed and covered, it definitely going to reduce the effects of cold and cough on the child. I have personally used saline drops on my kids and it works, especially if they’re frequently coughing or have clogged noses. It’s also doctor recommended so no worries there. Yes, you’re right. We should avoid exposing them to too much cold because it only aggravates a cough. Sometimes I also give them warm lemon juice. I’m not sure though if it can be given to babies (my kids are way past toddler age). Ask a pediatrician first before trying it. That’s good to hear that you have frequently used saline drops on your kids and it works perfectly well. At this way, I wouldn’t have to worry about it being effective in treating the cough or not. Personally about exposure of a baby to cold, I’m of the opinion that it’s better the baby feels heat than get cold and cough flu. Yes, it works well on my kids, thank God. Cold and cough are terrible both for kids and adults so I also hate it when it affects my kids. Even as an adult, I hate cough and catarrh flu more than any other illness. It gives me serious discomfort, that I would prefer to suffer fever to cough and catarrh. So, one can imagine the extent of worry it gives to babies. I think avoiding exposing the baby’s body to cold, it would definitely help in reducing the cold or even preventing the cough. I’m glad to hear that saline drops helps in soothing baby’s cough, I would make sure to relay the tips to some of my parent friends. And also, making use of steaming room to warm up the baby and using pillow to raise up their heads seems appropriate as well. Cough and colds are probably the worst feeling ever in addition to toothache/teething pain. It truly makes babies, even adults, uncomfortable especially if it’s just beginning – itchy nose, sore throat, you name it. Babies are often inconsolable when they have cough and colds so parents should be very patient and understanding when babies cry a lot. With few pills cold and cough cam be treated but I see toothache/teething pain as hells punishment. The reason why I don’t eat meat today is to avoid getting toothache/teething pain from poking my teeth after some particles of meat would be left in my tooth. I have several friends who have toothache and are forced to remove the tooth, after seeing and feeling their pains, I’m very scared of having toothache/teething pain. Yes, I guess you could say a toothache is like hell’s punishment, haha. I’d rather have colds than a toothache, LOL. You do have a “weird” reason for not liking meat, LOL. Typically, people do not eat meat due to health reasons, haha.